Meat and Potatoes Casserole, a baked dish, layered with potatoes, seasoned ground beef, cream soup sauce and topped with shredded cheese. I've been super busy the past few weeks, trying to get my spring gardening in before the heat sets into south Mississippi. It comes pretty quick, and seems quicker as I get older, and once it does, it makes it impossible for me to do much in the way of gardening. I just can't tolerate the heat anymore. You may recall that we moved a few years ago, and although this house had so many features we loved, gardens and flowers were not one of them. Previous owners had either not had an interest in planting, or had failed due to the east/west exposure. All the post-Katrina planting I did at the old house, which frankly was an awfully good selling point and one of the reasons the new buyers fell in love with the place, I'm having to completely start from scratch with at this house. 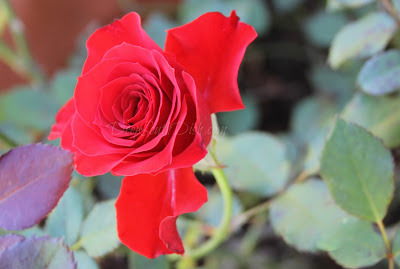 One of my Freedom hedge roses - I planted 4 more of them this spring! One of the first things I did here was to put a garden in around our backyard patio - it's one of my favorite places at this house - so spring is mostly a matter of clearing up the weeds and grass that have infiltrated it, and setting out fresh soil and mulch, and then adding a few new perennials, annuals here and there, and of course a few vegetables. Because of the exposure, most things I plant go into containers that I can move around, at least until I can see what will survive the intense summer heat where I place it. Although our house sits on an oversized lot and we have plenty of sunshine, I don't go overboard on veggies - just a few tomato plants, cucumbers, bell peppers, beans and herbs that I commonly use, is about all I have been doing the past few years. 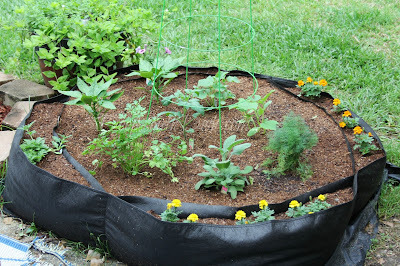 I never got around to rebuilding my square foot gardens here, or turning dirt for a garden either though, so this year I thought I would try a different kind of raised bed and found this fabric version on Amazon. I love having a small herb and veggie garden literally right out of the back door! 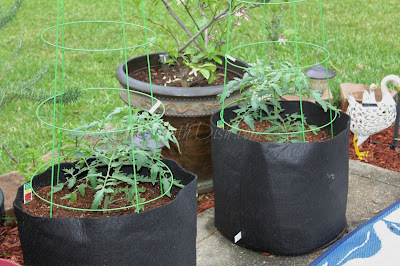 I also usually put out a few 5 gallon buckets with tomato plants as well, but they've not done that well the past few years, so this year I decided to try some of these similar grow bags from Smart Pots and planted three of them with Creole tomato plants. More breathable for the heat and lots more grow room for root growth in these. 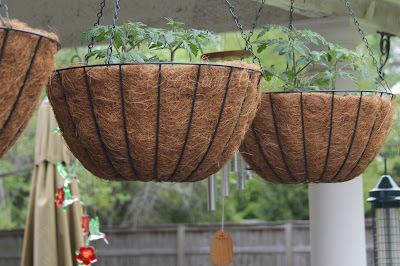 ...and some patio cherry tomatoes I put in hanging baskets. I don't know - we'll see how it all goes down on later into summer! I'm not much of a gardener so it's really just all hit and miss from year to year really. Anyway, far as cooking goes, I've been relying on some of my easy casseroles, and quick cooking, mostly skillet recipes, and some of the old standby recipes of the past, including this throwback to the 70s from my days as a new and very young bride. Made with layers of thinly sliced potatoes, seasoned ground beef, topped with a cream soup sauce and finished with cheese, it's a delicious and easy meat and potatoes casserole I'm sure that your family will enjoy. Here's how to make it and as always, scroll further down for the full recipe with measurements, instructions and a printable for your convenience. Heat butter in a large skillet over medium heat; add onions and bell pepper and saute until tender, about 4 minutes. Add garlic and cook another minute. Add ground beef and cook through, mashing as it cooks. I used to use my good ole potato masher to do this, but honestly with arthritis and carpal tunnel these days (the joys of getting older), makes even that a little harder. I love using a meat masher now though, because it cuts through the process quicker and is much easier on the old hands. 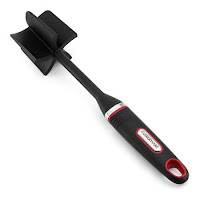 It's even good for mashing potatoes! Drain off any excess fat. There's that Easy Greasy again y'all! It's another kitchen tool I love, and because this colander has a base it sits on, you can drain off grease right at the stove. I use mine so much that I bought a second one! In a separate bowl, whisk together the mushroom soup, milk, salt, pepper and parsley. I had a can of Campbell's Golden Mushroom soup in the pantry, so that's what I used today, but use whatever variety you favor. Now... let's talk about potatoes. Anytime that you are going to prepare a casserole dish with sliced potatoes, such as au gratin or scalloped, you want the slices both thin and uniform, otherwise you'll end up with some that are overcooked, and others that are undercooked. You can counter that by parcooking them a tad, or even pouring boiling water over the slices and letting them sit, and while I have my new food processor (which as it turns out, I use more than I thought I would! ), I still tend to lean toward my handy, dandy mandolin for potatoes. I can zip through a few potatoes almost before I can even assemble the food processor, so it's super fast, and it's easy to clean too! I fill the bottom with water to hold my potatoes as I slice them all, to keep them from turning brown too and look how beautiful these slices are. You just can't get that by hand slicing. ...soup mixture and cheese. Repeat layers, ending with cheese. You're going to think there's not enough liquid. Don't worry. Just cover tightly with aluminum foil and bake covered at 350 degrees F for about 1 hour, then check to make sure the potatoes are fork tender. While it may not exactly photograph so beautifully (and I'm no photographer anyway), it's certainly tasty, and my meat and potatoes lovin' fella really digs this dish. So do I. Hope y'all do too! Preheat oven to 350 degrees and butter an oblong, 11 by 7-inch or 2-1/2 quart baking dish; set aside. Heat fat in a large skillet over medium heat; add onions and bell pepper and saute until tender, about 4 minutes. Add garlic and cook another minute. Add ground beef and cook through, mashing as it cooks. Drain off any excess fat. Meanwhile, in a separate bowl, whisk together mushroom soup, milk, salt, pepper, Cajun seasoning and parsley. 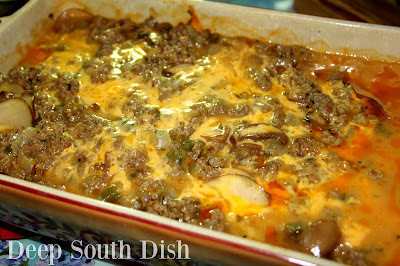 Layer half each in baking dish, in order, potatoes, ground beef, soup mixture and cheese. Repeat layers, ending with cheese. Cover tightly with aluminum foil and bake covered at 350 degrees F for about 1 hour, or until potatoes are fork tender. Cook's Notes: Hold potatoes in a bowl of cool, salted water until you need them; then drain and pat dry before layering. Double if using a 9 x 13-inch casserole dish. I used Campbell's Golden Mushroom soup. You may use any potato you prefer, peeled or unpeeled. I keep red potatoes on hand so that's what I used. 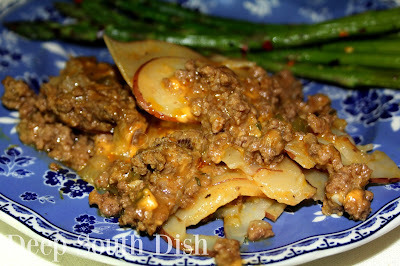 May also substitute leftover cooked roast beef or baked ham for the ground beef. 17 HUNGRY PEOPLE COMMENTED. ADD YOURS! You know the old saying, "Looks can be deceiving"!! I'm sure this is delicious. I made your recipe again this weekend using the Kraft Macaroni & Cheese!!! Yummy. That's another meal that is hard to have leftovers. Thank you so much for all your great recipes. You're welcome Vicki! Isn't that a great casserole? I love it! The recipe looks delicious. I make something like this with leftover chuck roast. I am planting trees, shrubs, a vegetable garden, etc. Our home is new and there was not any landscaping done when we moved in last August. The trouble is we have voles--varmints which eat everything. What size is the smart bag you show? I like the idea. I wonder if the voles could eat through these bags? Hi Tricia! Sounds like we are in the same gardening boat. It's an awful lot of work, but I'm taking my time doing a little more each spring. Hopefully I'll be around long enough to enjoy it all lol!! I made something almost exactly with leftover spiral sliced ham from Easter. The glaze juice from the ham really made this a unique and great tasting dish. Yes, it's really good with ham isn't it Pat?! I think the teen would love that. He's tired of grilled food. I bet he would Chris! Had this for supper tonight. I made it just as directed and my family Loved it! I always come to your site for "sure thing" recipes and this one didn't disappoint. Any idea if this would freeze well? I know potatoes can be iffy when frozen. Hey Sara & thank you so much! You know, I've not ever frozen this & I don't think that there's enough sauce. You'd typically want to make sure the potatoes are covered for freezing I think, but yes, you're right they can be iffy. The texture changes on them sometimes and they get mealy when frozen. Can you let me know if I use ground turkey should I still use cream of mushroom soup? Yes! The only thing is that ground turkey is much less lean than the beef so not as flavorful. You'll probably want to bump up the seasonings a bit to make up for the loss of fats. Mary, as always, I've got to sub something for the mushroom soup since hubby has mushroom allergy. Picked up ground beef and potatoes on great sales today, so was searching for another of your recipes to try and this looks great. Do you think any other soup flavor would give that same yummy richness? and I've got a turkey defrosting now, too, was thinking of trying this with ground turkey. What if I added in some chicken schmaltz? think that would help the dryness factor? stewed up a huge chicken last week so I could make your chicken salad, and I kept the hardened fat from the top of the stock. Thick that would help? Here it's just used as a white sauce really so you could make a thick roux replacement (2 T butter, 3 T flour & about a cup liquid), but I think that cream of chicken or celery would stand in fine if you're looking to still use a cream soup. As to the turkey, the schmaltz would probably work well to add in a little flavor! Otherwise, just a boost in seasonings will also help. This was a big miss instead of a hit. I normally love casseroles with mushroom soup in them and adore potatoes. Made this exactly as written and made sure it had plenty of cheese and it was totally flavorless! Bland as can be (I'm not one of those people who likes tons of spices either). Looked good but just no flavor. Was disappointed. I truly do apologize that your result was a miss, but that assessment is absolutely ridiculous! Your profile is new, so I'm guessing that you haven't ever been to my blog before and therefore don't know me, but I can tell you one thing. I don't cook or eat food that is "bland as can be" or "totally flavorless" and I certainly wouldn't publish a recipe on my blog that is. There is no way you could have followed the recipe "exactly as written." To clarify, here's the flavor profile for this specific recipe. Perhaps this will help someone else down the line that reads your comment. 1) Onion, bell pepper and garlic are a base flavoring for the meat. To reduce or omit any of those would make a difference in flavor. "Great for Cooking" versions are best however because the newer lower sodium, lower fat, more healthy versions are thin, poorly seasoned and not very flavorful. That's why the original is best for casseroles and is labeled specifically "Great for Cooking." 3) Ever tasted mashed potatoes where the potatoes weren't boiled in generously salted water? You can never seem to get the cooked product seasoned enough, no matter how much salt you use! Raw potatoes need salt at the least - salt, pepper and Cajun seasoning best for here as noted in the ingredients. You'd be surprised how much flavor just 1/4 teaspoon of Cajun seasoning (typically salt, black and red peppers and garlic at the least) would add, however if you don't ever use it, you'd likely want to make up for the loss in any recipe you use, by adding other spices or herbs. If you omitted or reduced those ingredients, or if you used a lower sodium kind of soup product or healthy request version, and failed to up your added salt, your potatoes will be under-seasoned. I like to mix the cream soup with the seasonings, since it's going into the layers, but you could certainly instead season each layer of potatoes. 4) Whole milk provides fat, and flavor. If you substituted a lower fat, 2% or other milk replacement in place of "whole milk" called for in the recipe, that's yet another loss of flavor. 5) This recipe also calls for sharp cheddar which is aged longer and thus has substantially more flavor than typical "mild" cheddar. Those are all the areas where flavor comes in. I hate that you were disappointed, but since you took the time to come back and leave a negative, public comment, without me standing there with you when you prepared it, I honestly can't say why with your result wasn't the same with all of these various layers of flavors in my recipe.